Jo Stevens and Paul Volta are The Sign. 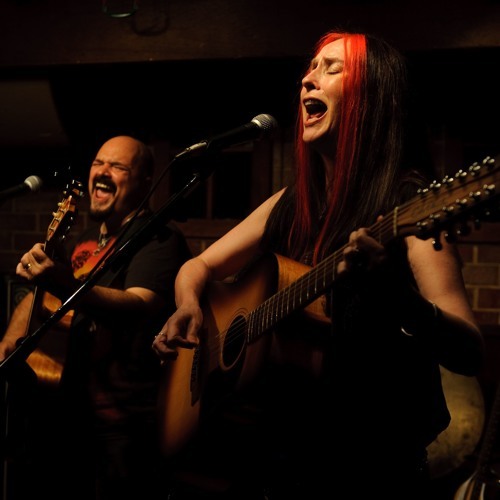 These fun loving recycled teenagers present their skills in a great show using 12 and 6 string acoustic guitars along with dynamic vocals and tight harmonies. Their exhilarating live shows always receive a great response either playing totally acoustic or with their recorded backing and video show. A mix of different styles have delighted audiences from Tokyo to Osaka, California to New York, Queensland to Tasmania and more. They are accomplished award winning songwriters recognized by APRA, Australian Songwriters Assoc. and Billboard. Their CD release Naked Glory according to one rock reviewer “is a greatest hits album and a must have”. The Sign have released three CDs; “Black Label Acoustic”, “Whole Lotta Love” and newest release “Naked Glory” available online from their website www.thesign.com or www.cdbaby.com/thesign3 and iTunes. A new album is scheduled for release in 2014. Great vocals, excellent harmonies and compelling lyrics are the trademarks of The Sign.